Sometimes you just want to abdicate the instruction of certain subjects in your homeschool. One area that seems to trouble me is writing. How do I adequately evaluate my child's writing? Am I qualified to teach my daughter how to improve her writing skills? *Disclaimer: I received this class, Essay Rock Star free of charge. I am being compensated for my time. These opinions are my own. My time is valuable and I accept VERY FEW reviews. It was my pleasure to assess this course and write this review. 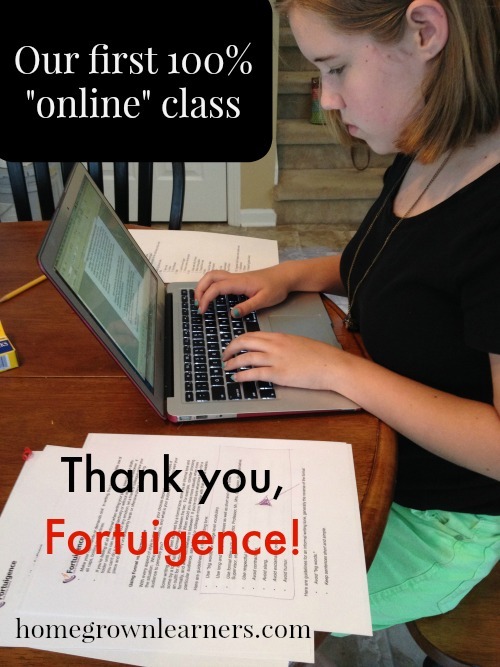 When I received the opportunity to write about Fortuigence, a company that specializes in online writing courses for middle and high schoolers, I jumped at the chance! 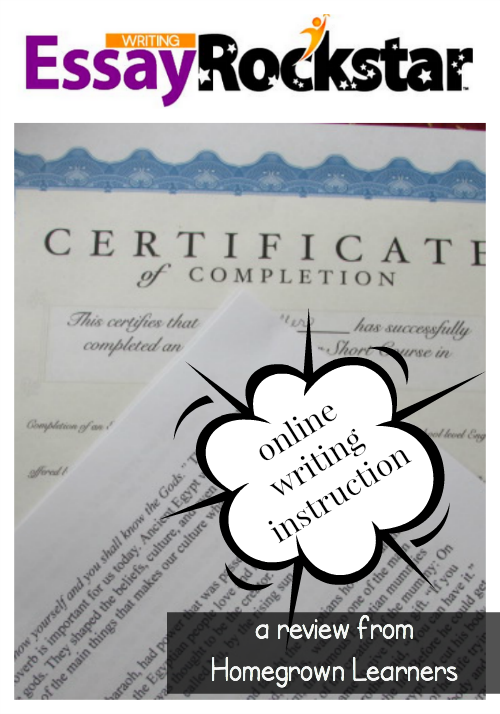 After spending the summer in the Essay Rock Star online writing course, Anna has a new and improved set of writing skills. I didn't have a thing to do with this improvement! The founder of Fortuigence, Lily Iatridis, is a degreed teacher. She spent time in the classroom and then decided to begin online writing classes. These courses satisfy high school English requirements and are taught 100% online. You can read all about Fortuigence on their website. Anna chose to take Essay Rock Star: The Expository Essay, a 7 lesson course. She completed this course at her leisure (it took about 6 weeks). In this short course, students learn to write an expository essay. The expository essay is the most common essay form that is often assigned in high school, college, and in the workplace. The purpose of an expository essay is to explain or inform an audience objectively about a specific subject. Before her course ever started, Anna and I had emails from Mrs. Iatridis, introducing herself and making herself available to us. I appreciated the communication she and Anna shared via email. This led to independence and self sufficiency. Anna was allowed to pick ANY topic that interested her. She chose Ancient Egypt. Mrs. Iatridis (through emails with Anna and brainstorming sessions) helped her narrow that topic down to the impact of Ancient Egyptian life on our lives today. Anna was so very pleased with this topic. She was introduced to the writing process in simple steps. Mrs. Iatridis guided her every step of the way. Listen to the short video that precedes each lesson. Read the lesson (there is also an option to listen to the lesson). Download resource articles to create your own writing toolkit. Complete the assignment and submit via the online classroom. Wait for the go ahead and feedback before beginning the next lesson. *Anna had ample say in what she was writing and her instructor offered much constructive, supportive encouragement along the way. She knew what to expect in each lesson and also received prompt feedback from her instructor. Even though Anna is just entering 8th grade, she received 1/8 of a high school credit for this course. She was able to download a formal Certificate of Completion and I am keeping this for her high school records. 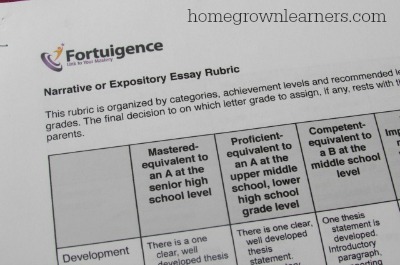 Fortuigence does NOT assign a grade to your child's work, and I like that. Mrs. Iatridis worked with Anna to get her essay to an excellent level and it is up to ME as the parent to assign a letter grade. I anticipate Anna taking other courses from Mrs. Iatridis to satisfy one of her high school English requirements. Fortuigence's "classroom" is simple and user friendly. For each lesson you can see Mrs. Iatridis give you an introduction. On the same screen you have the opportunity to read and/or listen to the lesson. On the left hand side of the screen you can see what lessons you have completed, what assignments have been submitted, and which ones are waiting for approval. Submitting work was as easy as uploading a document from our computer. Mrs. Iatridis accepted NeoOffice format (which we have on our Mac), which I found EXTREMELY helpful! Of course, she also accepted all other popular word processing formats as well. The whole process took NO EXPLANATION from me - my daughter took ownership of logging in, checking assignments, and communicating with her teacher. At this age your student MUST take "buy into" their coursework. Ownership is a BIG deal and motivation is key. Mrs. Iatridis was friendly and supportive. She was firm and knowledgeable and VERY encouraging. She also responded to emails within 12 hours! The expectations were clearly laid out. There was no time constraint with the class - nice that you can complete at your own pace. "I didn't know writing could be this easy!" Homegrown Learners gives this online writing course a HUGE two thumbs up. We will be using Fortuigence again and recommend this program wholeheartedly to our readers! FREE ebook - End Blank Page Terror Forever: 24 Pre-Writing Tools and Guidebook to Organize Content. Take Notes with Ease and Make Your Kids Confident Writers! 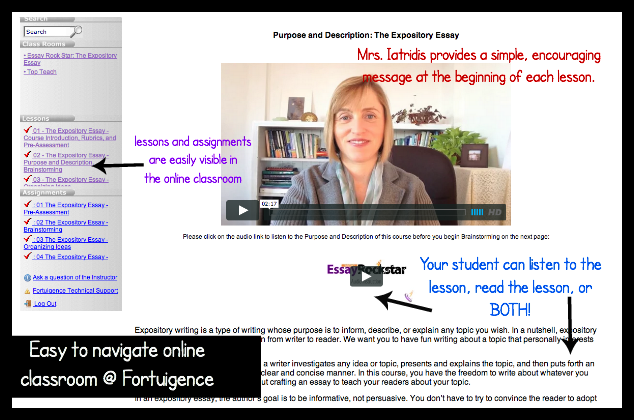 Please connect with Fortuigence and Mrs. Iatridis. She is very accessible via social media and email. I've enjoyed getting to know her throughout this process and consider her a valuable asset in our homeschool! One winner will receive their choice of any Essay Rock Star short course. Please note: Entry in this contest means that you agree to be added to the Fortuigence mailing list. You may unsubscribe at any time.